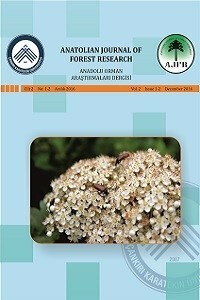 The Anatolian Journal of Forest Research publishes original articles relevant to all aspects of forestry. Main subjects are including: silviculture, forest planning, forest management and economics, forest engineering, forest botany and zoology, forest fires, forest ecology and forest utilization. On the other hand, the primary focuses of the journal are addressed by papers in sustainable forestry and forest management, climate change, biological diversity, and soil and water protection. The readership of the journal includes researchers, consultants, scientists, engineers, government and non-governmental organizations, and students. Manuscripts can be submitted in Turkish or English. The journal accepts original papers of high scientific quality by invitation from the Editorial Board. All manuscripts may be rejected without peer review if they do not comply with the instructions to authors or are beyond the scope of the journal. The Copyright Release Forms filled and signed by all authors must be sent to editorial office before publication process of the manuscripts can begin.